Location: Junction Highways 32 and “Grizzly Trail” 33; 200 km (120 miles) northwest of Edmonton, 80 km (50 miles) north of Whitecourt. Elevation: highest settlement east of the Rocky Mountains at 1210 meters. Population: 1858. 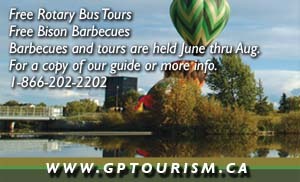 Visitor Information: Swan Hills Tourist Booth. Highway 33 follows the scenic and historic Grizzly Trail, the route taken out of Edmonton by Klondike Gold Rush Stampeders to the Yukon. The town of Swan Hills is situated on top of the largest oilfield in Canada, supplying nearly one-third of Alberta’s oil needs. The area around Swan Hills is heavy forest and muskeg, perfect for outdoor recreation, forestry and wildlife. The combination of virgin boreal and sub-alpine forest is made possible by the high elevation of the area, and provides Swan Hills with a rich legacy of rare flora and fauna not found anywhere else in the province. This legacy has been preserved at the Goose Mountain Ecological Reserve located northwest of town. The Goose Tower Road to the Reserve is a privately owned oilfield road that quickly becomes impassable in bad weather. With its above average snowfall and hundreds of miles of trails, Swan Hills is the perfect wilderness playground for snowmobilers, with a newly-added network of 350 kilometres of groomed trails to explore. These Golden Triangle Trails connect Whitecourt, Fox Creek and Swan Hills. In town, there are snowmobile-staging areas located at the Tourist Information Booth on Highway 33 as well as at Krause Lake. The Krause Lake trail system not only includes miles of boreal forest, but also takes snowmobilers past the historic Trapper Lea's cabin, which acts as an alternate staging area south of the town for people traveling on Highway 33. Area streams, rivers and lakes are full of rainbow and brook trout, perch, pike, walleye and grayling, and the area is also known for big game hunting. Swan Hills enjoys a 9-hole Country Club golf course. 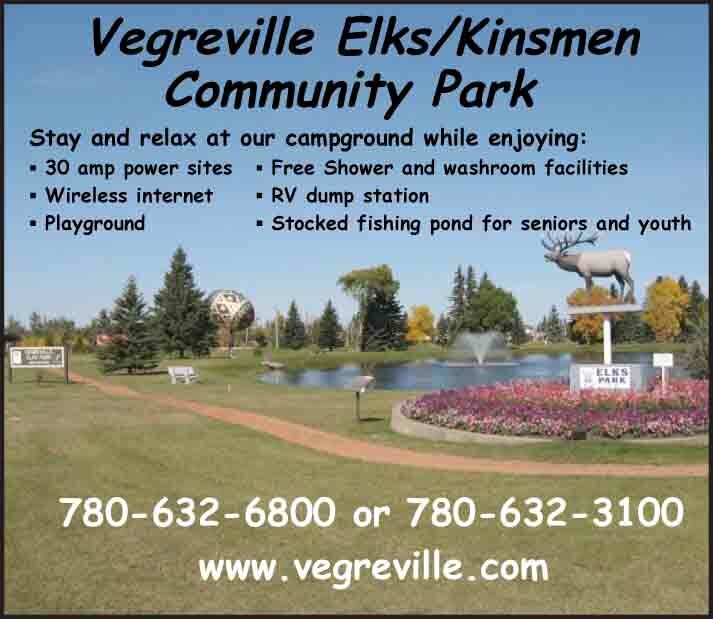 There are several campgrounds near Swan Hills. Along Highway 33 about 30 km outside of town, a short trail leads to a cairn marking the geographical center of Alberta. A Swan Hills grizzly paw print is inset on the back of the cairn. Second in size only to the Kodiak grizzly, the Swan Hills grizzly is a sub-species also known as the Great Plains grizzly. 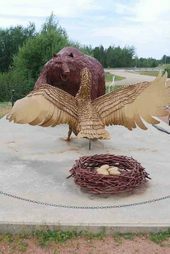 When entering Swan Hills on Highway 33, the first thing that catches your eye is the stunning copper and gold colored statue located next to the Tourist Information Center on the south side of the highway. This sculpture has been rated as one of the top 50 roadside attractions in Canada. The scene is of a mother swan protecting her nest of five eggs from a Swan Hills grizzly bear. One paw raised and mouth open, the bear waits for an opportunity to attack, but with her wings outstretched, the swan bravely holds her ground. The feeling depicted is one of strength and majesty that helps epitomize the natural and rugged beauty of the area. The unique steel sculptures, weighing approximately 2,000 pounds, were constructed in 503 hours by Kevin Oracheski of Edmonton, Alberta. Nearly 20,000 pieces of steel make up this truly unique piece of art. Oracheski is one of a handful of artists throughout the world who use this particular technique to sculpt metal.